What it’s supposed to be: A remake no one was asking for until it was announced, and then the idea of Peter Jackson’s follow up to The Lord of the Rings (welcome back to the list, Peter!) was highly awaited and heavily condemned. When the three hour behemoth of a movie arrived, it was everything people expected, no matter if their opinion was positive or negative. Why it’s a Christmas movie: The “third act” of the movie takes place at Christmas time, evidenced by ornaments and the dusting of snow. 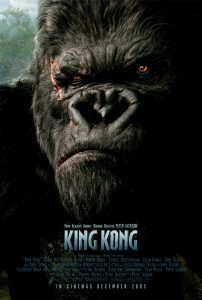 This is the portion of the movie that features the display of Kong as the 8th Wonder of the World, his escape and rampage, his time with the “beauty that tamed the beast”, and his death. In the midst of all of this, between rampage and death, we get a beautiful moment of Ann Darrow (Naomi Watts) and King Kong ice skating in the park. It’s interrupted by a nasty shelling from the army, of course, and it ends in the death of the “monster”. The mood of the season only add to the melancholy. Thoughts: Peter Jackson’s King Kong has a lot going against it: it’s a remake of one of cinema’s greatest achievements; it’s a serious attempt at making a movie for a franchise that sank into self-parody very early on; it’s LOOOOOONG and some say bloated, which is not helped by actors who some viewers do not connect with. It’s still fantastic cinema. The action sequences are glorious to behold. The technology, as with the original, pushed the boundaries between believable but fake and real. Kong himself is more realized as a character and becomes more relatable and, in some ways, more easy to empathize with. Yes, it is long, but I’ve only watched this movie in one sitting once: in the theater. At home, it was watched over a couple afternoons. Like Lord of the Rings, it is more of a serialized viewing experience than a singular one. Is It Naughty or Nice? Using the Christmas season well, so long as the three hour run time doesn’t bother you, this verdict is well deserved.